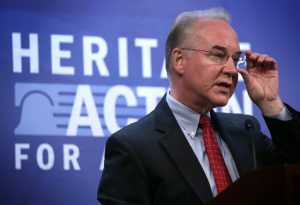 Price at HHS: Is Trump Undermining Medicare and Medicaid? “The Senate’s confirmation of Tom Price as health secretary is a body blow to the health and welfare of all Americans. According to this week’s Monmouth University poll, Americans’ biggest concern today is with their mounting health care costs, more so than their job security, taxes or other household bills. With Price at the helm of HHS, this concern is only going to escalate. “Price’s vision for reforming U.S. health care would result in millions of Americans losing existing health insurance coverage, and millions more having to make do with bare-bones policies that offer little to no meaningful protection. He can also be expected to push high-deductible health plans, which already result in millions of people forgoing needed care, and to undermine Medicare, the Medicaid program and safety-net hospitals. “If Price’s policies come to pass, the free-market ideologues who supported them will no longer be able to hide behind false promises like ‘universal access.’ The results will be laid bare for everyone to see, and elected officials will have to answer to the poor, working-class, elderly, and chronically ill Americans who will suffer needlessly as a result. Studies show that about 43,000 people will die each year if such policies are implemented. For more background, see: pnhp.org/stoprice.